The second semester of DigLibArts was an extremely busy and productive one. We’ll be updating this blog with specific examples of the innovative work that Whittier College faculty and students are undertaking, and this first Spotlight entry will look at the expansion of the Whittier College Digital Storytelling Project that has been spearheaded by Instructional Media Designer and Co-Coordinator of DigLibArts, Sonia Chaidez. 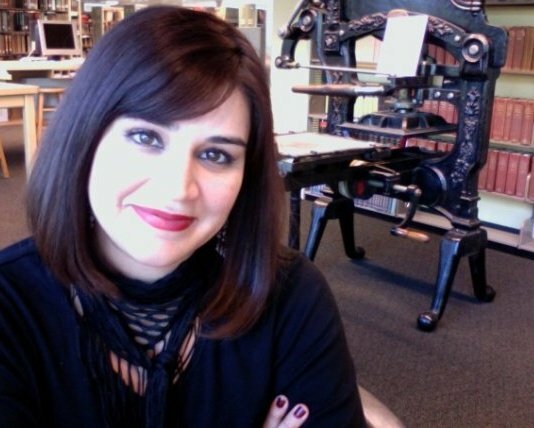 A filmmaker herself, Chaidez has been developing the resources for Digital Storytelling with Instructional Technologist, Kathy Filatreau at Whittier College for six years now. Sonia, tell us a little bit about your background and how you came to develop this Digital Storytelling initiative at Whittier College. In college I studied broadcast journalism to tell other people’s stories. I got a small job reporting news about science and technology- which started my path into trying to create entertaining stories out of otherwise dry material. I studied history in graduate school and began making documentary films. On location I would gather footage and interviews but in the editing room I had to put together a story. Even reporting on historical events took a point of view. The skill of writing a story and then adding moving pictures to convey a message can be powerful. It’s a way of communicating and sharing what we’ve learned and our point of view. This is what I think Digital Storytelling can do as a class assignment. What is the purpose of bringing Digital Stories to higher ed classes? How are these projects different from “traditional” academic output? When I first introduced Digital Storytelling at Whittier College it was as an assignment to help students develop 21st century literacies: the ability to use digital, visual, textual and technological tools in learning. I’ve found that it’s also a collaborative and creative process that captivates students while they share their work. Additionally, students gain information literacy skills as they evaluate sources and consider creative commons and public domain content to use in their digital stories. The Digital Storytelling process engages students in a way that helps them recall and reflect on the many themes and ideas discussed throughout their course. A digital story narrative is usually distilled from a larger writing assignment. We ask students for a one and a half, double-spaced typed script which results into a 3-minute recorded story. This is a challenging assignment for students because it’s an exercise in the economy of writing. The visuals (photos, graphics, or video) should fill in parts of the story that are not spelled out in the script. It’s a different way of communicating. You remember information best when there is a story associated with it. It forces students to think about a topic they’ve discovered or researched in their course and to think about how they will use multimedia elements to convey their message. We can agree that students are consumers of technology but this assignment asks them to be creators with technology. The final stories are in a digital format that is shared and peer evaluated in class. What kinds of classes have you been working with this past year? Digital Storytelling assignments have been incorporated into many disciplines including social work, philosophy, music, environmental science, biology, history, English, religious studies. This past year we had two classes in sociology discussing critical studies of race, class, and gender that produced interesting and informative digital stories. For other programs and faculty who may be interested in incorporating digital stories into their coursework, what are the minimum tools needed? Do you have recommendations for software, hardware, training, or personnel? Kathy Filatreau, our campus Instructional Technologist, and I usually work as a team to help faculty who are interested in Digital Storytelling as an assignment. We meet with faculty to set dates to facilitate the process of making digital stories. This includes class visits to introduce the assignment and then workshopping the narrative in a process we call storycircle where we hear drafts of stories and give feedback. 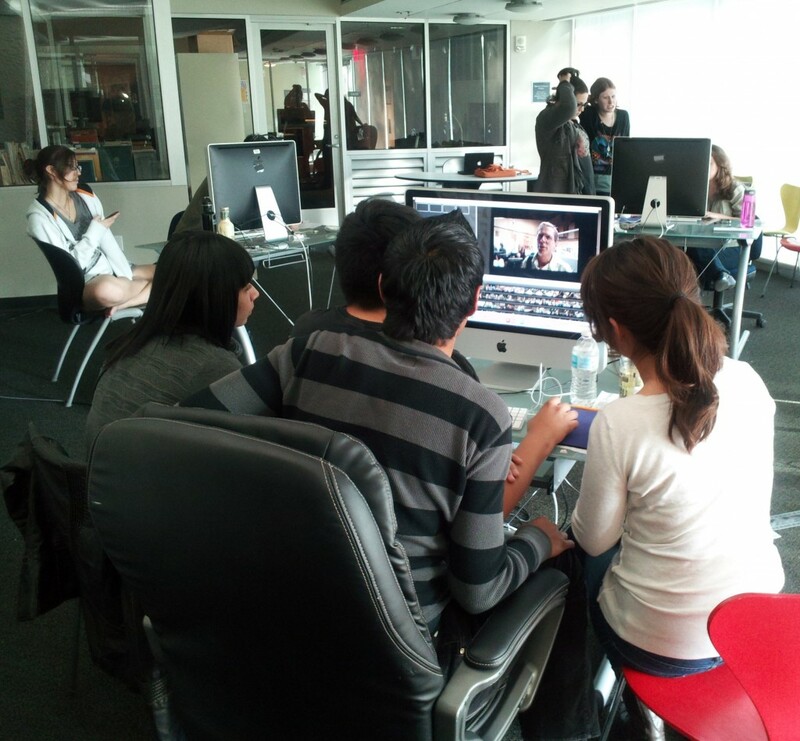 Finally, we set a technology date where students learn basic digital video editing tools. This is the second year we are using a collaborative, web-based editing suite called WeVideo. Students are added to our institutional account where they upload their recorded narratives and visuals to edit them with graphics and effects. They can also work together online inside WeVideo and share content with their professors. Faculty are encouraged to create digital stories and become part of this digital creation process. This past year we’ve also added #askusanything hours where students can drop by or make appointments to get help from our DigLibArts student technology liaisons inside our new Collaboratory. How have you seen Digital Storytelling evolve since you’ve begun this project? We started with just a couple of students that created digital stories for one philosophy class. Kathy and I have now facilitated close to 600 student-produced digital stories. The majority of faculty in the music department now include a Digital Storytelling assignment every semester for every class. We’ve also partnered with the social work department and this assignment is a requirement for senior final projects. During finals we feature a film fest to share all of the digital stories produced within each class. For some courses, especially the social work digital stories, we invite President Herzberger, the campus community, internship directors and parents. We clap, cheer, and sometimes cry. It’s one of the highlights of my year! What’s up next for the Digital Storytelling project? A new addition to our Digital Storytelling project is evaluation and assessment. This February we will hold an ATLAS.ti (a qualitative data analysis and research software) workshop which will aim at evaluating the Digital Storytelling process as well as the completed digital stories. I first heard the term “Digital Storytelling” from the Center for Digital Storytelling based out of Berkeley, CA. I’ve attended several of their workshops. Digital Storytelling has also evolved to include print, audio, and technology-based projects that reinvent the way stories are told. UC Irvine held a Digital Storytelling conference last spring that focused on the field of literary journalism. The New York City based symposium Future of StoryTelling brings together game-theorists, digital media strategists, journalists, programmers and even neuroscientists to imagine new ways of telling stories. Next on my radar is to re-awaken the concept of radio shows that predated television or even the podcast to facilitate audio-only projects where we create stories with no visuals–just a recorded narrative, music and sound effects.